For most travelers, Bali is the epitome of paradise. Friendly locals, cheap and delicious food, coconut tree speckled beaches, warm water, and an accepting culture make just about anyone feel like they’ve been welcomed into a second home. The guides to Bali can besomewhat predictable. Those who’ve done their preliminary research will soon discover that they must party at Kuta Beach, walk through the UNESCO Tegallalang Rice Terraces, Eat, Pray, Love in Ubud, and trek Mt. Batur to watch the sunrise. While all of these are great experiences that shouldn’t be missed, there’s more to Bali than just the basics. We’ll reveal the top five things to do in Bali that will take you off the heavily trod tourist trail. When it was built, Taman Festival Bali was supposed to be the main tourist attraction on Bali’s Bukit Peninsula. It’d even feature a $5 million laser show to wow attendees of all ages and nationalities. After a slew of bad luck and terrible decisions, the investors for Taman Festival Bali went bankrupt. Taman Festival Bali was left to be reclaimed by nature and many locals believe the property not hosts evil spirits as squatters. 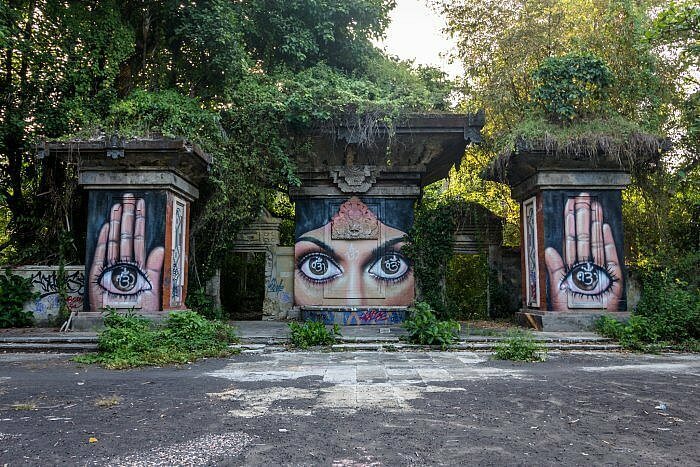 Inside Taman Festival Bali, you’ll see old rides overgrown with vines, graffiti, broken glass, and dilapidated buildings. It’s said that crocodiles that were on display in the theme park were simply left to fend for themselves and could be wandering through the property today. How to get there: Cycle or take a taxi to the end of Jl. Pandang Gakak in Sanur. The theme park borders the beach. The Lempuyang Temple is one of Bali’s oldest and most sacred temples. Many who visit simply make it to one of the lower platforms, and then continue on their sightseeing journey. To experience Lempuyang Temple as a local would, those who are able to should walk the to the top of the temple — 1720 steps from start to finish. It’s a pilgrimage that demands an acute awareness of your surroundings, as some of the stairs can be extremely slippery from the moss. After a few hundred steps, the walk is meditative to even those of us who have the busiest minds. It’s best to go with a local who will advise you on the nuances on how to behave and what to offer at each portion of the journey. Guides at the temple itself can be hit-or-miss, so you’ll want to arrange one outside of Lempuyang Temple. If you have a local simply accompany you, you’re less likely to be harassed by those simply wanting to earn a few bucks escorting you up the stairs. How to get there: Lempuyang Temple is in Karangasem. The address is Banjar Purwa Ayu, Desa Tribuana, Abang, Karangasem. The U.S.A.T Liberty was a cargo ship that was used in both World War I and World War II. In 1942, a Japanese submarine torpedoed the U.S.A.T Liberty, where its captain beached it on the shores of Tulamben. In 1963, Mount Agung, Bali’s largest volcano, erupted and placed the U.S.A.T. Liberty under the sea where divers and snorkelers now use it as a top diving destination. The U.S.A.T Liberty has proved to be an incredible place to see marine life. The hull is covered with corals and reef fish, nudibranchs, anemones, turtles, reef sharks, and eels hide in the nooks of the ship for protection. If you visit the shipwreck on a clear day, you can see the entire ship — that sits on a slope from 25 to 200 feet. How to get there: The U.S.A.T Liberty is off the shores of Tulamben in front of Puri Matha. Visitors often complain that the most visited part of Bali, the southern Peninsula, is too modernized and crowded. However, if you take a boat to Nusa Penida, a small island off the coast of Bali that is still within Bali’s jurisdiction, it’ll be almost as if you’ve stepped back in time. You won’t be competing for the best spot on the beach or feeling like you’re stuck in a tourist trap in Nusa Penida, for the few people who do stay there are sustenance farmers. The best way to experience Nusa Penida is to rent a motorbike and explore wherever the road takes you. Some suggest stops are Crystal Bay, the Temeling Waterfall and temple, and Atuh Beach. 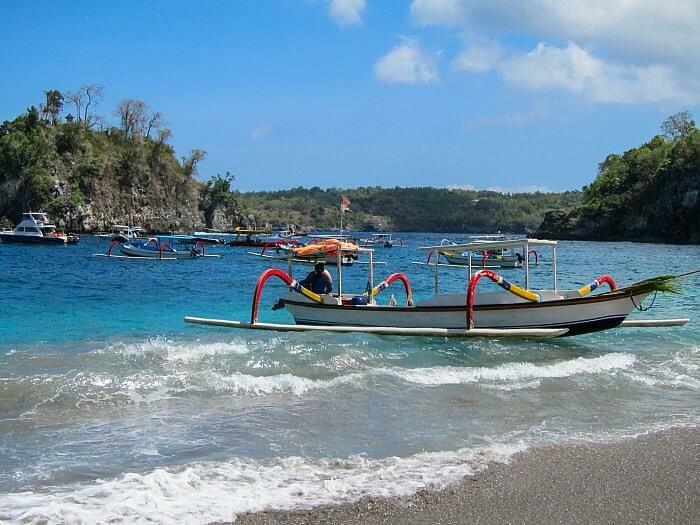 How to get there: Take a boat from Sanur to the shores of Nusa Penida. Motorbikes can be rented for 70,000 – 100,000 IDR per day. A Kecak ceremony is a traditional dance that has been a staple of Balinese culture for centuries. Tens of Balinese men and women sing and dance in a circle around performers who tell a story. Oftentimes, the main performers interact with the audience, making it an experience that you feel a part of — rather than just a spectator of. Prepare to be awed as the performers leap over flames and use fire as a form of communication. How to get there: Though there are kecak ceremonies all throughout Bali, the best one is at Uluwatu temple because it overlooks the ocean. 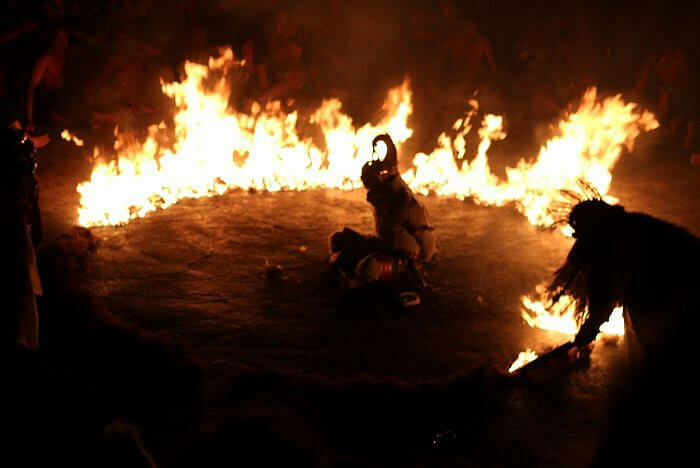 Kecak dances often take place around sunset and span into the night. What part of Bali would you like to see most?